Monoblue villain decks (or their hero counterpart for that matter) hasn't received a lot of love in the Way of the Force era. They were the meta defining decks in the late Legacies meta with Kylo/Anakin sweeping all before them at Worlds 2018 and Mads Utzon's Rey/Aayla conquering the European Championships 2018. But in a world first, albeit briefly, dominated by 3wide hero mill, then ruled supremely by Snoke, there hasn't been a lot of space for 2 character aggro decks, whether it be middle/middle or big/little iterations. Kylo Ren's power level, and with it also his popularity, has waned as the world of Destiny went all rainbow (long live diversity!) and the collective health pool increasing across 3 character line-ups. Even monoblue heroes seemed to be unable to capitalise on the absence of their bane, falling victim to the same flaws as had downed their villain rivals: Their ramp simply wasn't powerful enough to deal with the sustained bombardment of vehicle decks, which in turn were playing out more aggressively than ever - even managing to upset the "rock-paper-scissor" balance by consistently defeating mill decks (and one might add THE STRONGEST mill decks ever introduced to Destiny). The mill decks in turn consistently defeated 2 character aggro decks. WTF?! 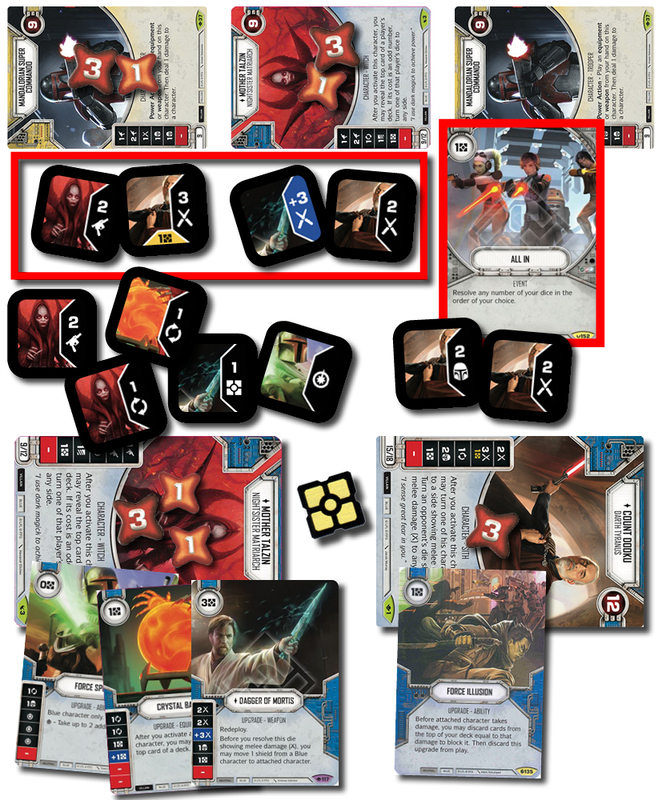 It's okay to be confused because CRAZY STUFF was going in the world of Star Wars Destiny! 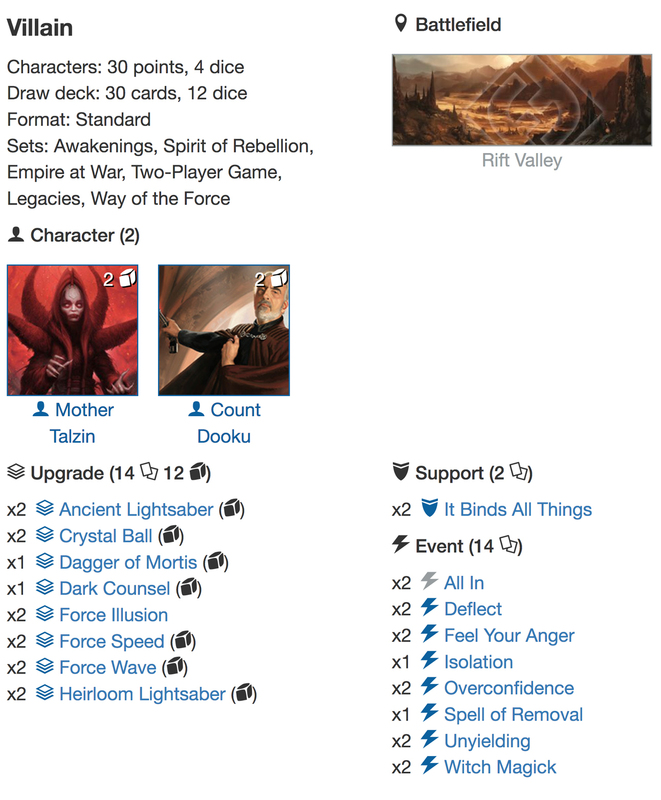 In an attempt to kill two birds with one rock Nick Cuenca had the audacity to show up at the US Nationals 2018 with the Dooku/Talzin deck, which on one hand deals so excellently with mill decks because it needs very few cards to be lethal AND is capable of putting loads of pressure on the support characters in 3wide vehicle decks. Nick did an EXCELLENT write-up of the deck and his journey to Top4 at the tournament, and if you are smart you'll read that one (after you finish this article obviously!). 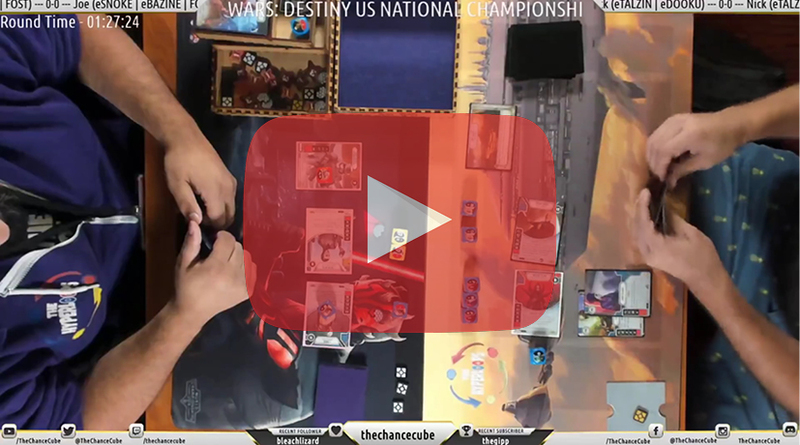 The Chance Cube recorded this great stream from the US Nationals 2018 in the top8 between the two team mates, Nick Cuenca and Joe Colon from the Hyperloops, displaying some amazing game plays with this deck! COUNT DOOKU and MOTHER TALZIN is all about consistency, and a level of consistency almost unprecedented in Destiny. They can maximise their damage output almost effortlessly and will be able to put pressure on an opponent from the get-go! It's not only their abilities, but also their Focus sides that will enable you to constantly apply pressure when needed or tank if required to do so. A lot of decks are currently running preciously little mitigation, mostly due to the meta that was so massively affected by the sudden appearance of mill decks, and Dooku/Talzin are extremely punishing to decks that cannot present at least 1 mitigation card per round. It also means that your opponent's mulligan strategy has to take this into account. A lot of players will primarily be looking for combo pieces, i.e. 0-0-0, Friends in High Places, Anakin Skywalker's Podracer or strategic cards such as Chance Cube or Sith Holocron, and because these are two-offs most players will also dump their entire hand to maximise chances of mulliganing into them. Against Dooku/Talzin you will not want a first or second round without mitigation. Against most 3wide character line-ups this could (most likely will) mean a dead character round 1! 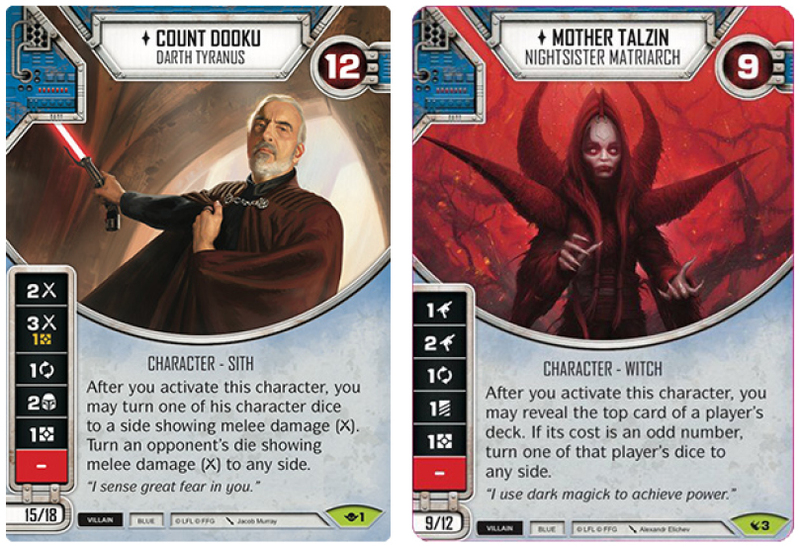 Count Dooku and Mother Talzin also excel at playing around mitigation cards. 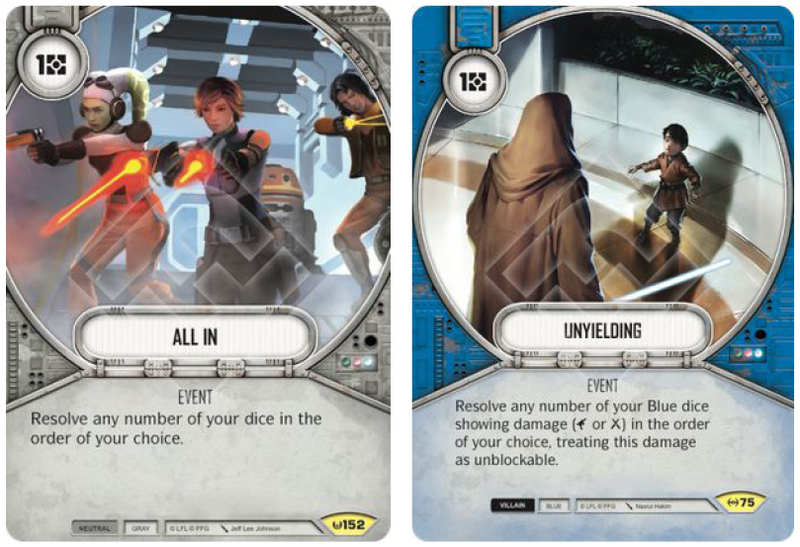 Prevalent mitigation cards like Easy Pickings and Entangle, that both affect multiple dice, are extremely difficult to use or get the optimal effect out of against this character pairing. Even mitigation cards like Overconfidence will not impact the pair to the same disruptive extent as other decks. If you have already maximised your dice or have the results you want (are satisfied with), then don't get greedy. Don't put all your dice in the pool, but simply resolve them piecemeal, that way you also get to avoid ugly Mind Tricks or Into the Garbage Chute. At least make your opponent work for it! Sometimes players get a bit confused concerning the ability of Count Dooku! Just to clarify. 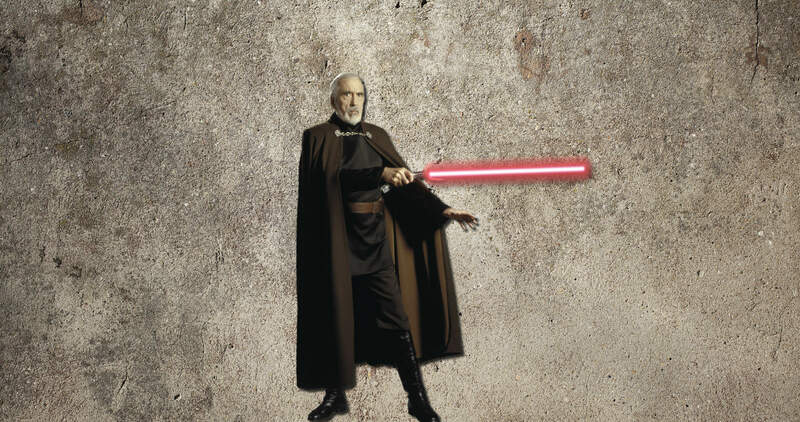 Dooku's ability is an AFTER ABILITY following the standard rules: It is a MAY ability, and IF you choose to use the ability, you resolve AS MUCH as possible, including turning an opponent's die showing Melee damage to any side, and turning means to turn the die to ANOTHER side! 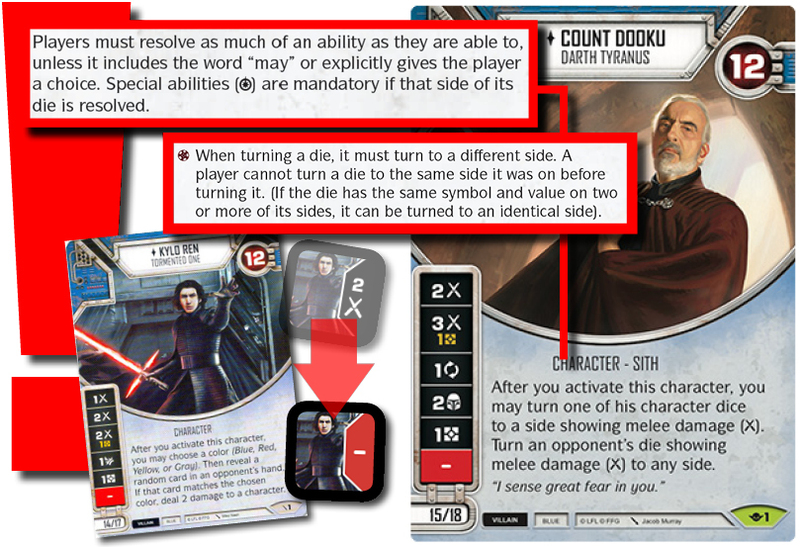 This obviously also means that against other Melee based decks Count Dooku has a bit of built in mitigation, which might actually raise Dooku's stock a bit against Kylo Ren, who does look to have the upper hand both in terms of cost and overall value! 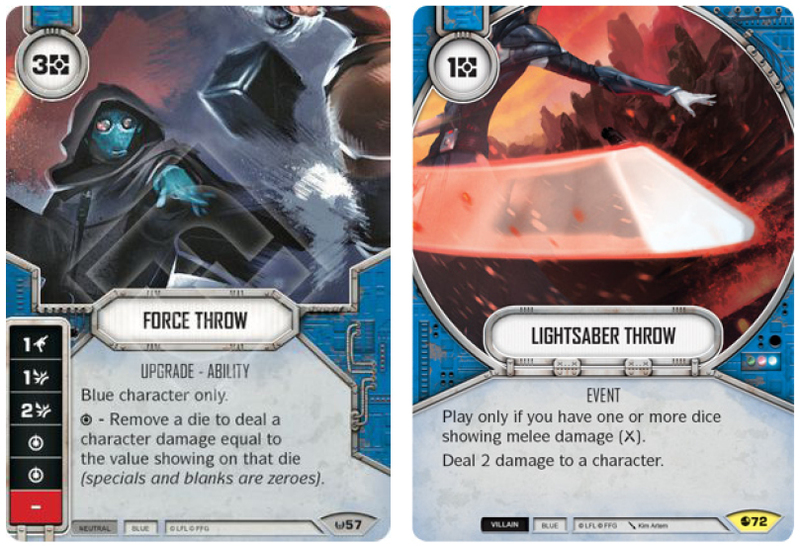 Since Kylo will "always" hit a blue card in your deck (you run 28 blue/2 grey), then at least you'll make him earn the rest of his damage output by mitigating the best Melee side every round (for as long as Dooku is alive). 3. TO HOLOCRON OR NOT TO HOLOCRON? For different reasons, many of them meta defined, there was a general switch to Lightsabers and Melee damage, which meant access to Close Quarters Assault, Ancient Lightsabers and Redeploy on some of the best upgrades at your disposal. Access to Ancient Lightsaber in order to effectively increase your health pool which is pretty low in an age of Planetary Bombardment and Doctor Aphras. Maximising profit from Count Dooku's ability! The argument for running Holocrons remain the same as before, nothing has changed, powerful ramp and access to what currently looks like really powerful upgrades. 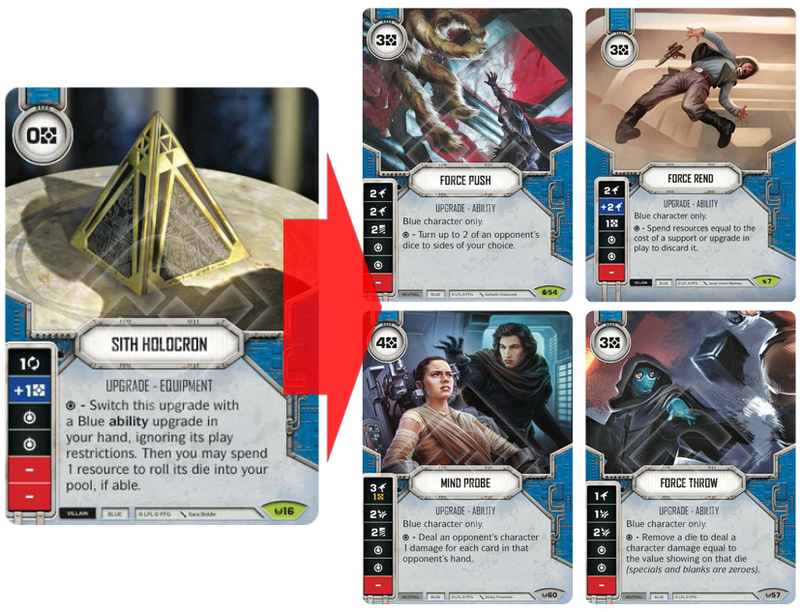 And admittedly, in the current competitive environment the Holocrons do look more alluring than ever, with both Force Wave and Force Throw being red hot on the radar for anyone trying to challenge the meta. It's hard to argue against the inclusion of any of the 3 Lightsabers included in the deck, with ANCIENT LIGHTSABER representing insane value in particular in a deck that only boasts 21hp. DAGGER OF MORTIS and HEIRLOOM LIGHTSABER both has Redeploy in this deck and both have great damage sides. Heirloom Lightsaber is arguably the better fit for the character team is a whole, whereas the Dagger of Mortis is the superior weapon with Dooku. The special ability of the Dagger is still nice to have, but doesn't look nearly as powerful now as when it was first released, mainly due to blue heroes falling out of favor in the meta. FORCE SPEED is as always immensely powerful, and can easily set up some plays that snipes off characters, whether it's Force Speed Special into activating your second character into All In or Unyielding. All of these plays can and in most instances will lead to a dead character! FORCE WAVE seems to be necessary in a world obsessed with 3wide character teams, and it's BONKERS with Talzin. Being able to ALWAYS ensure a Force Wave Special and forcing your opponent into mitigating puts a lot of pressure on your opponent. Put it on Talzin and overwrite it with a Dagger or an Heirloom Lightsaber if she's being focused down. FORCE ILLUSION ... you gotta ask? Nah, thought so ... one of the absolutely best cards in the game! Both CRYSTAL BALL and DARK COUNSEL can be played for free with IT BINDS ALL THINGS and both have two Focus sides, and Dark Counsel is excellent at sifting through your deck to find the cards that you need. Crystal Ball is good with your Spell of Removal, makes Talzin's ability reliable as mitigation of your opponent's dice and also allows you to check whether or not your opponent will be able to take advantage of the Battlefield: Rift Valley. That last point is really important as most of your own die sides are 2 or less!! It Binds All Things is a dead card in your hand from round 3 and going forward. I will even consider pitching it to reroll as early as round 2 if it means I can find damage to kill off a character. It is your only ramp card though and looks good in your starting hand. You run 10 mitigation cards, including Force Illusion and WITCH MAGICK. All of them are odd costed and have varying uses. There will be games where you just feel like you never have the right mitigation card at the right time, but that's the name of the game. ISOLATION might only hit character dice, but in an age of Snoke it's really good to remove those support character dice and avoid early ramp, while only the sky is the limit with FEEL YOUR ANGER, but you will also have rounds where there just aren't any targets for it. 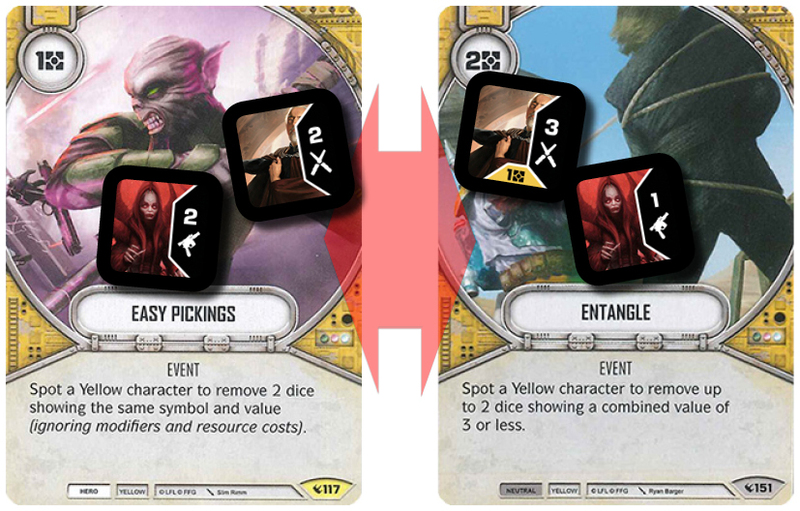 Removing two dice is great and more can be a wrecking ball to your opponent's turn. You don't HAVE to remove 100 dice with Feel Your Anger to be worth it. Sometimes one die is just great if it's the right one! SPELL OF REMOVAL is an almost removal of a die. I often hear people saying they don't like to discard a card from their deck, but would you rather take a 6 Indirect damage from a Planetary Bombardment to the face? Sometimes you just need to put things into perspective. OVERCONFIDENCE is great. And Count Dooku's dice are great for the "Overconfidence battle"! 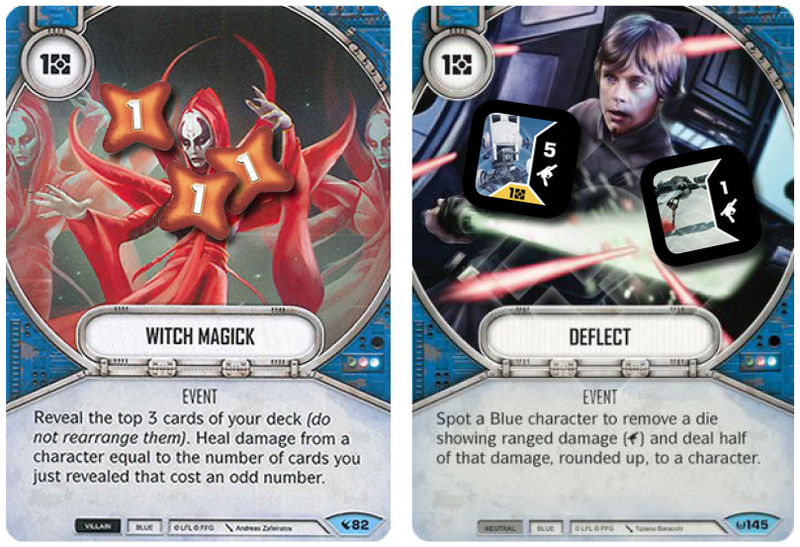 Dooku will win against most characters due to his 3/2/2/1/1/- and in your deck the Spot requirement is no problem. WITCH MAGICK is great and most of the time you'll heal 3 and once in a while it will be only 2. You should always mulligan for even costed cards, not just because of Witch Magick and Talzin's ability, but because your 4 even costed cards are some of the best in your deck: Force Speed and Ancient Lightsaber. You'll need these early in the game anyways! DEFLECT is a meta call, and as long as ranged damage based vehicles are around it will be a great card, which is not only removal, but also a damage swing in you favor. You DON'T need to Deflect a 5 Ranged damage from an AT-ST for it to be worth it, sometimes just removing a 1 Ranged damage from a Resistance Crait Speeder or similar is more than fine! ALL IN and UNYIELDING are your tech cards and both allows for some awesome plays that can either snipe off characters or put lethal damage in when your opponent doesn't expect it. The flexibility of either using Force Speeds to action cheat your mixed damage sides out or making the damage unblockable with Unyielding or setting up bonkers All In plays turning fairly average rolls into massive lethal damage! Be smart with you sequencing and watch out for those Probes that are becoming more and more popular! RIFT VALLEY is crazy good in this deck. It's deceptively good! You might not be the fastest deck in the format, but you are definitely not the slowest either. You have rounds where you play an upgrade, activate and fix dice, mitigate, resolve, activate and fix dice, mitigate and resolve ... done! Finishing off with a Claim where you get to remove a die is just the icing on the cake. And it's an almost guaranteed removal due to our good ratio of odd vs. even costed cards: 26:4. This is really an upgraded version of Frozen Wastes, which is one of the strongest battlefields for fast paced decks, with the one exception that Rift Valley is MUCH harder to use against you unless your opponent is also running Mother Talzin, in which case you'll most likely either be playing a mirror match or against Talzin/Mandalorians, and the latter is a much slower deck than you! It's a great find for the deck and it's just absolutely brilliant! Obviously, drawing both your It Binds All Things in your starting hand would be outrageously good, and it's not likely to happen, so you'll be happy to see one as well as an Ancient Lightsaber and a Force Speed. I like to see my Isolation early as that's where it feels the most powerful and the Dark Counsel is great to start going through your deck as well as offering you some valuable Focus sides early. You want to play your It Binds All Things followed by Force Speed. Don't play your Ancient Lightsaber immediately, but wait and see if you need your mitigation or if either Dooku's ability (when playing against Melee decks) or Talzin's ability can take care of it. You might wanna consider starting out with Force Speed + Dark Counsel on Talzin, activate, and use Talzin's ability to find a Resource side, then play the Ancient if you estimate that you don't need the resource for mitigation. Your first round is really important with this deck because you need to put loads of pressure on your opponent. You need to be the aggressor! You want to put upgrades on Mother Talzin and make sure to get those Redeploy weapons on her if she's being targeted down. With a combination of mitigation, Witch Magick and Rift Valley you might be able to keep her alive until round 3, but you'll most likely lose her round 2, hopefully after she get to resolve all her dice. WHEN you lose Talzin, you need to make sure that Dooku can finish the game. If you bait your opponent properly, he should be putting a lot of muscle into grinding Talzin down, and might be in a weakened position to take on a 12hp Count Dooku, possibly with 2 or 3 upgrades on him. It will be difficult for most characters to resist a Dooku with an Ancient Lightsaber, Heirloom and Dagger of Mortis. I'v actually never had 3 weapons on Dooku, but he will still take care of business with less! Beware of your resource management, and often the 2 Melee side is superior to the 3 Melee for 1 resource. It's a good idea to grab resources early in the game, unless you can find damage that can secure a kill or set up an early kill in round 2. I do believe that it would be worth considering Force Throw in the deck. It looks pretty crazy on Talzin early in the game, and might even replace Deflect or you could do a 1/1 split between the two?! I've also been tinkering a bit with Lightsaber Throw for some out of hand damage, and possibly a first round kill on 8hp or less support characters. The resource curve might be a bit prohibitive though.